By studying an undergraduate Zoology degree at the University of Leeds, you’ll have the opportunity to play a part in understanding how animals interact with their environment, how organisms play a part in various ecosystems, and how we can try and avoid damaging the wildlife of the world. Our integrated Masters offers you an additional year of specialist training. You’ll study Masters-level topics, carry out an extended research project and have the chance to study savannah ecology and conservation in Kenya. Zoology is the study of animals at all levels, from their evolutionary origins, molecular and cellular biology to their behaviour, ecology and evolution. There are many global challenges such as food security, invasive species and biodiversity conservation that are affecting the planet and with the study of Zoology, you will learn practical skills that can help address these real-world issues. Field courses options including Marine Zoology in Pembrokeshire, Mediterranean Ecology in Spain and African Ecology in South Africa. Conduct a research project or mini-research project during every year of your degree. Extensive practical work with modules such as Detecting invasive specieswhere we use cutting edge molecular techniques to identify cryptic species and ask fundamental questions in evolution and conservation. Research-led Advanced Topic modules in your final year cover topics as diverse as Human Genetics, Conservation Science, Evolution and Animal Behaviour. 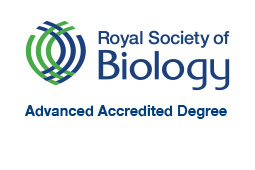 Our BSc with Industrial Placement Year and MBiol courses have been accredited by the Royal Society of Biology. Advanced degree accreditation by the Society recognises academic excellence in the biosciences, and highlights degrees that educate the research and development leaders of the future. The advanced accreditation criteria require evidence that graduates from the programme meet defined sets of learning outcomes, including gaining a substantial period of research experience. Year 1 is a fantastic introduction to Zoology. Core modules will introduce you to how zoological research can address global challenges such as food security, invasive species and biodiversity conservation, using approaches from genetics and whole-organism biology to ecology and fieldwork. You’ll experience the exciting world of scientific research right from the start, with a strong emphasis on the application of fundamental research through short research projects and field work. In Year 2 you’ll continue to develop your laboratory skills and zoological understanding. You’ll begin to specialise in the core topics of zoology, including animal behaviour, development, evolution and physiology. You’ll also have a marine zoology field course, and optional field courses in Mediterranean ecology, and in UK ecology and behaviour, each including research projects. This degree offers the opportunity to take an industrial placement or a study abroad year at the end of Year 2, which is a great way to broaden your skills, enhance your university experience and boost your employment prospects. A highlight of Year 3 is the chance to carry out your own independent research. This will give you the chance to use the skills and knowledge you’ve gained so far to carry out a project focusing on a topic that interests you under the supervision of one of our field-leading experts. Diverse projects reflect the expertise of our staff, with study systems involving birds, whales, invasive species, parasites, crop pests and farm animals. Projects can be field, lab, literature or computer based and our best students have published their projects as scientific papers. You’ll study topics at the cutting edge of zoological research, including the evolution of animal culture, behavioural ecology, conservation, animal science and bird behaviour. You'll also have the chance to go on our popular optional field course in South Africa. Years 1 and 2 are the same as for the BSc and provide a foundation in the subject. In Year 3 you’ll prepare for Masters-level by studying compulsory and optional modules and undertaking an independent research project. You’ll also conduct a literature review in preparation for your extended project in your final year. Key to Year 4 is your independent project during which you’ll join a lab at the cutting edge of research. This helps to develop the high-level research and professional skills that will serve you well in your future career. You’ll also choose Masters-level modules such as Population Dynamics, Infectious Diseases, and Conservation Genetics. Year 4 will also give you the chance to take an optional field course to Africa. The African field course is based at Mpala Research Centre, Laikipia, Kenya. It will provide you with a first-hand appreciation of the ecology and conservation concerns of an African savannah community, both for the wildlife and the people who live in the area. This course is also available to study part-time over 6 years. If you choose this option you'll study alongside our full-time students and the course content will be the same, but delivered at 50% of the intensity. As these courses are delivered primarily for full-time students you may need to attend the University on several occasions each week. Times are likely to vary with each new semester and will depend on the scheduling of compulsory modules and your choice of optional and elective modules. You’ll have access to the very best learning resources and academic support during your studies. We’ve been awarded a Gold rating in the Teaching Excellence Framework (TEF, 2017), demonstrating our commitment to delivering consistently outstanding teaching, learning and outcomes for our students. You’ll experience a wide range of teaching methods including lectures, tutorials, practicals and field research. Your first and second years will focus on these teaching methods, building your skills, understanding and knowledge in preparation for your final year research project, which will see you take on independent research and learning with the guidance of leading experts. Across all years, additional workshop and seminar sessions will complement your lectures and lab practicals, and you will also undertake private study. Residential field courses provide an opportunity to study animals in their natural environment, with small group teaching and projects in animal development, behaviour, ecology and conservation. As a guide, a typical week in your first year includes nine to twelve hours of lectures, three to six hours of practical sessions in the laboratory, tutorials, workshop and seminar sessions, plus private study. Independent study and research are also crucial to every year of the course. We have excellent library and computing facilities to support your learning, and the University Library offers training to help you make the most of them. We use a variety of assessment methods to help you develop a broad range of skills. These include practical work, data handling and problem-solving exercises, multiple-choice tests, group work, online and face-to-face discussion groups, computer-based simulations, essays, posters and oral presentations. Including Biology and preferably another science or science-related subject. If Biology is the only science subject then an A grade is required. Critical Thinking and General Studies excluded. We accept the following science subjects: biology, human biology, chemistry, mathematics, physics. Science-related subjects: computing, environmental science, food science, geography, geology, PE, psychology, science in society, statistics, use of mathematics. Applicants taking a Science A-level (in England) will be required to achieve a pass in the practical element in addition to the standard A-level grade requirement. We accept the following science subjects: biology, human biology, chemistry, mathematics, physics. Science-related subjects: computing, environmental science, food science, geography, geology, PE, psychology, science in society, statistics, use of mathematics. GCSE: GCSE: Grade 6 (B) or above at GCSE Maths and Grade 4 (C) or above at GCSE English. We do not accept Access to HE. Applicants with BTEC qualifications (Diploma or Extended Diploma) are required to have A2 level Biology (Maths, Chemistry and Physics may be acceptable alternatives depending on the BTEC subject). Distinctions in the BTEC subject and an A or B grade (BTEC subject dependent) for the A-level subject are required. Applicants with BTEC Subsidiary Diploma qualifications must have at least 2 A2 levels and at least one of these must be in Biology. We do not accept BTEC qualification. D3/D3/D3-D3/D3/M1 including D3 in Biology plus one other science or science-related subject. D3/D3/D3 including D3 in Biology plus one other science or science-related subject. 35-34 (with 18-17 at higher level) including 6 in higher level Biology and another science or science-related subject at higher level. 35 (with 18 at higher level) including 6 in higher level Biology and another science or science-related subject at higher level. H2,H2,H2,H2,H2,H2 - H2,H2,H2,H2,H3,H3 including H2 in Biology and another science or science-related subject at higher level. H2,H2,H2,H2,H2,H2 including H2 in Biology and another science or science-related subject at higher level. Advanced Higher: 5 x Highers AABBB, with AA-AB in 2 Advanced Highers including Biology and preferably another science or science-related subject. General Studies and Critical Thinking excluded. If Biology is the only science subject then an A grade is required. Science subjects include: Biology, Human Biology, Chemistry, Maths and Physics. Science- related subjects include: Computing, Environmental Science, Geography, Geology, P.E, Psychology, Science in Society, Statistics, Food Science and use of Maths. Scottish Higher: Scottish Highers not accepted on their own. Advanced Higher: 5 x Highers AABBB, with AA in 2 Advanced Highers including Biology and another science or science-related subject. General Studies and Critical Thinking excluded. AAA - AAB including Biology and another science or science-related subject. General Studies, Critical Thinking and Advanced Skills excluded. AAA including Biology and another science or science-related subject. General Studies and Critical Thinking excluded. We welcome students from around the world and consider a range of qualifications. If your qualification or country does not appear on our entry requirements page, please contact our admissions team. Taught at the Leeds International Study Centre, this two-semester course is equivalent to the first year of an undergraduate degree. It aims to help you develop the skills you need to join the second year of a Biological Sciences related degree. IELTS 6.0 overall, with no less than 5.5 in any component. . For other English qualifications, read English language equivalent qualifications. We welcome applications from mature students. We welcome applications from mature students from all backgrounds onto both full-time and part-time programmes. It is also possible to study this programme part time. The programme content is the same but you will study at a lesser intensity. Find out more about how to apply, support available and the part-time student experience at the Lifelong Learning Centre. Part-time fees are normally calculated based on the number of credits you study in a year compared to the equivalent full-time course. For example, if you study half the course credits in a year, you will pay half the full-time course fees for that year. If you have the talent and drive, we want you to be able to study with us, whatever your financial circumstances. There is help for students in the form of loans and non-repayable grants from the University and from the government. Find out more in our Undergraduate funding overview. As well as providing you with subject-specific knowledge, we aim to equip you with the best possible skills for a variety of future careers. All of our degrees have a strong emphasis on practical based teaching, small group teaching, online learning and problem solving. Throughout the degree, you’ll gain a wide range of transferable skills which are highly valued by employers. Supported by the Leeds for Life scheme and your academic and personal tutor, you’ll be ideally placed to focus on your personal development and make the most of your time at university. We have a dedicated employability team in the Faculty of Biological Sciences who work closely with the University’s Careers Centre to support your development. We offer a host of additional opportunities beyond core course content, including volunteering and placements. These include our annual Faculty Graduate Panel, where graduates are invited back to talk about their work and network with our students, and our STEM Careers Fair, which gives you the chance to meet bioscience employers, such as AstraZeneca, Covance, GSK, Nuffield Health, RSPB, Yorkshire Wildlife Trust, speak to alumni, attend workshops and get masses of information. We encourage you to prepare for your career from day one. Thats one of the reasons Leeds graduates are so sought after by employers. Leeds for Life is our unique approach to helping you make the most of University by supporting your academic and personal development. Find out more at the Leeds for Life website. The Careers Centre and staff in your faculty provide a range of help and advice to help you plan your career and make well-informed decisions along the way, even after you graduate. Find out more at the Careers website. If you choose to undertake a study abroad option, you will spend the third year of your course studying abroad. This will extend your studies by 12 months. Practical work experience can help you decide on your career and improve your employability. On this course you have the option to apply to take a placement year module with organisations across the public, private and voluntary sectors in the UK, or overseas. Find out more about work experience on the Careers website. Industrial placements are typically taken after your second year of study. If you choose to undertake a placement year, this will extend your studies by 12 months. For your work placement in industry, staff at Leeds will help you with your CV and application letters and provide a list of organisations which may offer industrial placements. Placements abroad are possible. We work together with your industrial supervisors to make sure you get the most out of this year. A year working in industry gives you an excellent opportunity to get used to the demands of the world of work, to develop new skills and to augment your CV. One of the most exciting aspects of our degrees is the range of opportunities for fieldwork on offer. Field courses offer valuable opportunities to apply your knowledge and practical research skills outside of the lab, so we offer at least the option of a field course in every year. A week’s in-depth study of animals and plants in their natural habitats. Students are allocated to a group and each group has its specialist topic. For example, you may explore diurnal rhythms in insects, rocky shore diversity, seaweed ecology or how parasitic disease affects animal distribution. We have a chance to observe birdlife, seals and even whales (and the ice cream shop!). This optional course is based at Malham Tarn in the Yorkshire Dales, an internationally important reserve in a spectacular limestone landscape with a wide variety of terrestrial and freshwater habitats. Projects might include territoriality and habitat preferences of woodland birds, the ecology of carnivorous plants, cave spiders and limestone pavement ecology. Plus there’s our infamous treasure hunt and pub quiz. The beautiful Pembrokeshire coast offers us unparalleled biodiversity on sandy shores, rocky shores and mudflats. A key feature is that we use a range of disciplines. We explore the developmental biology of marine animals, their evolution and adaptations to the challenges of marine life, their behavioural interactions and community ecology. Students also design group projects: examples include in vitro fertilisation in limpets, sea squirt development, vigilance behaviour in shorebirds, antipredator jumping in shrimps and aggression in crabs. Usually involving a trip to the Iberian Peninsula, this course allows you to explore issues surrounding biodiversity conservation across Europe, including the challenges of growing human populations and habitat restoration. You’ll work in groups of two or three to conduct independent research projects. Recently these have included social interactions between macaque troops, the effects of feather parasites on bird performance and thermoregulation in lizards. This exciting optional field course is based at the Shamwari Game Reserve in the Eastern Cape of South Africa. The area is rich in plants, birds and mammals (including the ‘big five’ – elephant, rhino, buffalo, lion and leopard). Group projects designed by the students centre on the theme of a ‘landscape of fear’, and there are also guest lectures by local experts, a bird diary to complete, night drives in safari vehicles and a boat trip to watch birds and sometimes even whales. Our MBiol also offers you the chance to go to Kenya in your final year to conduct research at the Mpala Research Centre with a focus on ecological, conservation and wildlife management challenges in a semi-arid savannah environment. The course will be based primarily around small-group projects that are of ecological or conservation relevance to the region. This will reinforce and broaden your knowledge and understanding of the area and build upon aspects of the ecological training received at Leeds.